When I started dating Tom, I made it clear from the start that I was a huge nerd. Not nerd as in, “I like to read.” But nerd as in, “I live and breathe books and authors and often connect every life event to a character or title ad nauseum.” Tom embraced my nerdiness, which wasn’t difficult for him since he is also a gigantic book-nerd-Star-Wars-fan. Luckily for me. As we learned to know each other, Tom suggested that we each recommend one book to each other. However, the stipulation was that the book we recommended had to be in a voice similar to our own. The book didn’t need to mirror our life experiences, but it needed to “sound” like me and “sound” like him. I was geeking out. Nobody had ever asked me to do this before. 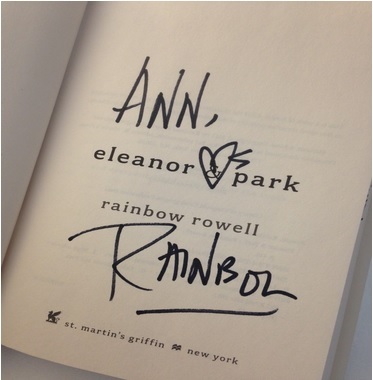 After much obsessive perseveration, I chose Eleanor & Park by Rainbow Rowell. Not because I was a high school kid in the 80s, and not because I had a life like Eleanor. Rowell’s voice in this book is so much like my own. I felt like I could’ve written it. Later in the fall, Rainbow Rowell came to town and I dragged Tom along. After waiting in a line that stretched around the building, we were privileged with an hour in an auditorium, listening to Rowell speak. She was funny and sad and brilliant. I knew, then, that I had Tom hooked on Young Adult novels and author talks. As time went by, we continued to read and talk about books (and grammar) and we wondered, “Are there actually other people in the world sitting in the dark talking for hours about Stephen King’s 11/22/63 like we are?” We came to love each other during these book talks and Oxford Comma discussions. When we decided to get married, it was small and intimate. Could there be a better place to get married than in my favorite book store? I think not. This past fall, we tied the knot in a quaint, sweet, independent bookstore in town. The store owner and her employees graciously gathered up as many wedding books as they could, placing them around the small area where we would be married. Also in the background, were multiple copies of Eleanor & Park. Ann King DiBella is a third grade teacher in Indiana. You can find her on Twitter @kingandkids. This is an absolutely beautiful love story and a tribute to the power of books! A sweet tribute to a great book. Congrats on finding each other! I have yet to read this…Looks good! What a perfect match you two are! I think you absolutely captured the conversation Eleanor and Park would have at your wedding ! A perfect romance! I predict a long, happy marriage. Unless, of course, y’all disagree about the Oxford comma. That could be a deal breaker. Thanks for sharing your story! THIS IS AWESOME. I want to re-do my wedding now. Ha! Thank you! Maybe you could renew a few vows in a local book store? This is so darn sweet! You wrote it!! I jumped up and did a dance when I saw this post in my in box this a.m. I remember the twitter chat we had about this – a this should be a blog post, a nerdy bookclub blog post . . . And here it is! Again congratulations! So happy for you. Thank you so much for your encouragement, Carrie. I appreciate you so much! I loved Eleanor and Park, too. Thanks for this delightful post. Such a lovely post! 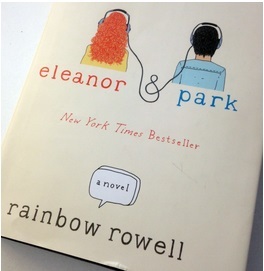 I loved Eleanor and Park and loved the inspiring way it was composed. I hope someday I can find a man that appreciates my nerdiness too! this is amazing it just shows how much books can affect peoples life’s! That is so amazing! I love Eleanor and Park! It’s such a great book. Thank you for sharing your beautiful story! A romance through reading 🙂 Now I am picturing my daughter getting married in a bookstore – the perfect setting for her! I’ve encountered this book at bookstores many a time however I always seem to skip over it. Idk why. But I think I’ll read it now after hearing how much you like it. Yes, please do! People have differing opinions about this book. I would love to know your thoughts. This was absolutely adorable. I wish my Partner liked books this much; we’d get married again in a book store. I’m absolutely smitten by the idea. LOVE LOVE LOVED this book! Thanks for the great review.. i love to see someone else’s perspective on a book i enjoyed. Oh my, I just loved reading your post about E&P. I too teach 3rd grade and grew up in the late eighties listening to the Smiths and trying to survive high school. How great that you had a bookstore wedding! I am very impressed and in awe.